The following is a list of the citizens that attacked four of our men on Lowe’s Island, killing two of them, and stripped and left them so that the hogs ate them: Dr. William B. Day, Dr. John Day, Thomas Carper, John Coleman, Gilson Jenkins, Samuel Jenkins, Thomas Coleman (who now has one of the pistols taken at that time), James Farr, Philip Carper, James Carper and Stephen Farr. They are all residents about Dranesville. This information was furnished by three of Mrs. Coleman’s negroes who came into Camp Griffin November 26, 1861. And thus blood was shed at Lowe’s Island. However, let me admit the date in my teasing title is a guess. The fragmentary report gives no indication of the actual date. The killing (and leaving for the hogs) of two soldiers happened sometime in November August of that year, and the message’s receipt at Camp Peirpoint just a few days prior to McCall’s report. However, I find it appropriate to offer a speculative date for this incident since Lowe’s Island is in the news… and in the news specifically because of speculative Civil War history. Yesterday the New York Times ran a story concerning a plaque at the Trump National Golf Course, pointing out the glaring inaccuracies. Normally I don’t post about political topics. But this particular subject sort of lands in my lap. So I’ll attempt to step around the politics while pointing out the history amid the rhetoric. It is my great honor to have preserved this important portion of the Potomac River! – Donald John Trump. You will find dozens of articles (some quoting Civil War authorities or written by such authorities) that are going to say “nothing” happened at the site during the Civil War. I’ll give them some benefit of the doubt, maybe nothing of grand importance happened on the site of the golf course. But the truth of the matter is somewhere between “River of Blood” and “nothing”… with the needle much closer to the nothing side of the scale. The site of the golf course is Lowe’s Island, on the banks of the Potomac, here in Loudoun County (though very close to the county line). The island is formed by an old chute of Sugarland Run. What those of us from the Mississippi bottom lands would call a slough. That channel passes between Lowe’s and the mainland, then empties into the Potomac just above Dam No. 2 and Seneca Falls. The area may be familiar to readers, as it close to Rowser’s Ford. Circling back to the 1861 incident, on November 26, Colonel George Bayard, 1st Pennsylvania Cavalry, led an expedition to the Dranesville area. 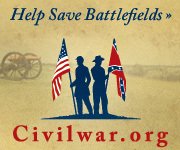 Bayard’s objective was to capture Confederate pickets known to be posted at the town. This was somewhat a precursor to the Battle of Dranesville, which would occur the following month. Bayard would succinctly report, on November 27, “We killed or captured all we saw.” Among the names of those captured, Bayard offered many of the same listed in the note from Hawkshurst. So either Bayard just cast a very wide net and happened to bring in the suspects, or he had in mind specific individuals when setting out on the mission. So there you have it… the “river of blood” at Lowe’s Island amounted to two soldiers, whom we don’t have names for, who were killed by some local citizens. (UPDATE: Ron passed along some more information on this. The soldiers were from the 34th New York.) A far fetch from what is written on the plaque. And that plaque? Why are we making it news, some 154 years after the blood flowed on Lowe’s Island? I think you can answer that question without much thought. I’d simply say that when the “news” is something this stale, one has inclination to question the messenger as much as the message. In his defense of the plaque, Trump gave something like a “my people talked to other people” response. I will add that back when I first became aware of the plaque, my line of inquiry lead me to the names of two local historians who were said to have provided services to Trump’s business. That does square with the narrative – Trump’s people discussed this with some local authority. That authority provided the customer what he wanted to hear… and what would sound really nice on a plaque. At a minimum, an authority who was unwilling to correct a mistaken appreciation for the facts. And I think we need to keep that in mind on this issue. There are all sorts of folks out there selling a brand of “snake oil” that reads “history” on the bottle’s label. It’s not hard, in Virginia, to concoct a story that is pleasing to the ears and the egos, given the rich history that appears on every corner. Likewise, it is not hard to shuffle aside history where inconveniently in the way of some project. That last part is why I object to the plaque. Even if corrected for the historical inaccuracies, the plaque is like a dagger thrust. Lowe’s Island was not preserved. And the use of that verb on the plaque is a much larger miscarriage of fact than saying the Potomac ran red. Craig, as you know, this reprehensible phenomenon of “historians for hire who will say what you want them to say” is a practice that is not unique to Donald Trump. Once upon a time (1988-89), a developer bought up thousands of acres of a large cavalry battlefield known to your readers. On behalf of the Association for the Preservation of Civil War Sites, Inc. (today’s Civil War Trust), I met this thuggish developer from California and informed him the acreage he just purchased (6000 acres) comprised the center of this pristine battlefield. This was all farmland, by the way, and zoned agricultural, but the developer deigned to turn America’s greatest cavalry battlefield into a mammoth corporate office park. The developer’s predictable reaction was to go to war with us, and he quickly hired a “local historian from Loudoun County,” who proceeded to minimize the importance of the Battle of Brandy Station, and who further alleged certain historical events occurred at places other than which they actually transpired, i.e., meaning far removed from the developer’s acquired property. One of the threshold events of this momentous battle, for example, involved the bold attack of the 6th Pennsylvania Cavalry at St. James Church. The developer’s historian concluded–much to our amazement, and in direct contradiction with battle accounts and sketches–that this courageous charge took place on “airport property,” well east of the St. James Plateau!! Well it took some doing on our part, but we ultimately prevailed in the end, and the developer went back home to his Newport Beach yacht with his pockets turned inside out. And as for our local historian.. Presumably, he was paid for his services, but he very impolitely disappeared without saying good-bye, and we have never again heard from him at Brandy Station.. We do not miss him. And as for Brandy station, this fabulous battlefield may well soon be a Virginia State Battlefield Park..
Could this event be referring to the Battle of Bull’s Bluff, about 15 miles upstream? A young Oliver Wendell Holmes was wounded there, and he kept his blood stained uniform. Union forces were repulsed with many casualties, and their flight back across the Potomac probably did bloody the waters. No, I don’t think he was referring to Balls Bluff. That would be absurd! Anyone making that suggestion needs to be cut off right away – READ the text of the plaque. It indicates two things: first a battle was fought RIGHT THERE. Second, Trump preserved that battlefield RIGHT THERE. To say he conflated Balls Bluff, one is essentially saying one of those two (if not both) are true. NEITHER is true! So let’s stop trying to come up with excuses. It’s wrong. Period.